Thanks for visiting my site. Here’s a bit about me. These are the elements that make up who I am as a human being and as a photographer. I love a well told story. I try surround myself with stories and storytellers. I am an advocate for those who want or need to tell their stories. Photography is one of my favorite mediums for telling stories. Every single photograph has a story within it. A camera therefore is a powerful tool. I use my camera for the purpose of telling stories and capturing moments in time. I consider myself both a storyteller and a memory archivist. I capture moments in time to store into the collective library of impressions from our everyday lives. Want to shoot some photos together? Want tips? Want me to capture moments of you, your family, or an event? Contact me! I am a dad to Micah and Ezra. Most of my time is spent watching and caring for them. I’ve seen them grow, learn, thrive, fight, and play. Everyone likes taking pictures of their kids. Being a dad has helped me slow down and grow in my patience and long-suffering. It has helped me to find humor and beauty in the mundane. Moments worth capturing that I want to remember forever. They change and grow up so fast. My camera helps slow down the clock a bit, and helps me enjoy the journey all the more. It helps me notice and remember the small details that seem to fade from our memories otherwise. Would you like me to take some photos of your children? Want some tips about how to take some yourself? Contact me! I am a husband to Sarah. We’ve lived in Indianapolis, Pensacola, Chicago, and now Omaha. We’ve learned what compromise, sacrifice, and commitment look like. The places we’ve lived together, grown together, and loved together have special places in our hearts. My camera has given me the ability to capture some of our favorite moments together. I’ve learned that even the small details of the places we’ve lived together make up a significant part of who we are as a couple. Want some engagement photos? Want me to take pictures at your wedding? Perhaps just simple lifestyle pics? Contact me! I love to process. I love thinking and finding the deeper meaning in things. Photography gives me the ability to both appreciate the moment I am capturing through my lens, and to find and perhaps even create a deeper meaning through my post-processing. I like discovering the thread that runs through a number of photographs. Over time I’ve learned not only to find the moments that would make a good picture, but also how I can create certain moods through my photography. Have events or moments you’d like captured? Would you like to tell a story through photography? Want some post-processing tips? Contact me! I am enjoyer of life. I love finding the beauty in the moments, places, and people around me. Of course every moment in life isn’t fun or pleasant, or even all that interesting. But I’m always hopeful and optimistic in every situation. My attitude doesn’t shy away from the messiness of life, but finds opportunity in life’s challenges and obstacles. It’s an opportunity to be present and to sometimes be bold — to be strong and rely on those around me to help capture the moment. My experience in life has helped me become more empathetic, and that has impacted how I tell stories through photography. Photography is a journey and every photograph is a chance to learn. Want to join me or follow me on this journey? Connect with me on Instagram. Contact me if you want to get together some time. I love adventure, exploring, and dreaming big. I love capturing moments that express the excitement of life. Nature. Landscapes. Photowalks. Spontaneous moments that pop up begging to be captured. Photography can help express and preserve those moments of exploration, adventure, and freedom. The earth is huge. Time is infinite. Photography helps us remember that. It stops that clock that is always ticking, providing us a way to relive our adventures at a future date. Photography is time traveling. Our cameras are time machines. Want to share your journey with me? Contact me and let me join you on your journey. Let me travel back in time with you. I believe that all human beings bear the image of God. Therefore, all people have intrinsic value and worth. All people deserve to be seen and heard, for we all have stories to tell. As a Christian I believe the greatest and most important story ever told is that of Jesus Christ and the salvation and hope that he offers us on our journey together here on this earth. The beauty all around us is simply a reflection of the beauty, love, creativity, and presence of God. And as a photographer I get the privilege of capturing that beauty through my lens. I get to participate in the telling of God’s story. How does your faith impact your view of the beauty and the people around you? I’d love to hear from you. 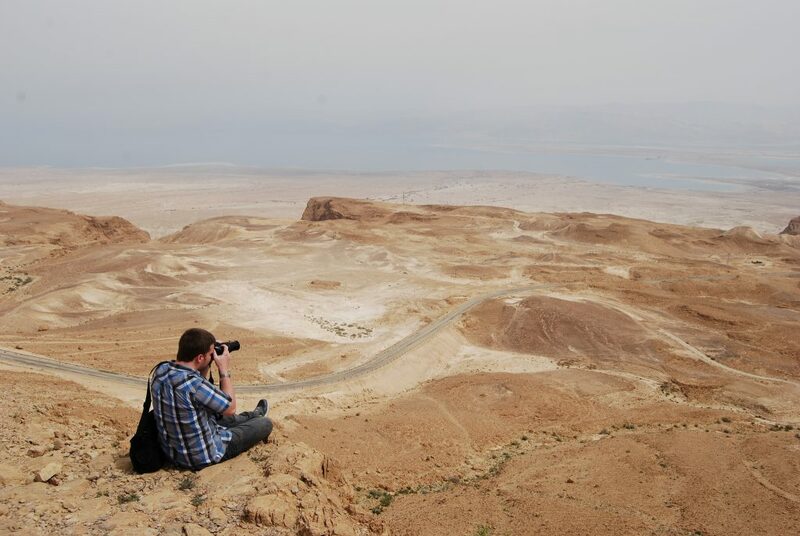 Sitting on the edge of a cliff in Israel near Masada and the Dead Sea. I’d love to see the world through your eyes. Send me links to your blog or Instagram or Twitter. I’d love it if we connected via social media.